The Optoma HD36 boasts great colours, superbly bright images and excellent built-in speakers. It's an ideal, low-cost, beamer for everyday use even in daylight. The real issue issue with this otherwise quality projector is that solitary HDMI input if you're using more than one source. Single-chip DLP projectors aren't much cop. They're loud, their black levels are dodgy, and they often display distracting 'rainbow effect' throughout. But don't tell the HD36, which manages to swerve all of the technology's common downfalls – and for a nice price, too. Selling for £799, the HD36 is aimed at those wanting a permanent, or at least semi-permanent, home cinema projector set-up both day and night. That makes a lot of sense; the number of people who only want to use a home cinema in the hours of darkness are few. Cue the HD36's inclusion of a 310W lamp that can pump out 3,000 ANSI Lumens, which is brighter than any other home cinema projector. It's also one of the best-equipped projectors for casual audio; a built-in 30W speaker will come in handy for on-the-hoof games nights when there's no proper surround sound system to slot into. If you're after truly footloose Full HD, try the add-on WHD200 Wireless HDMI system sold by Optoma for £200. 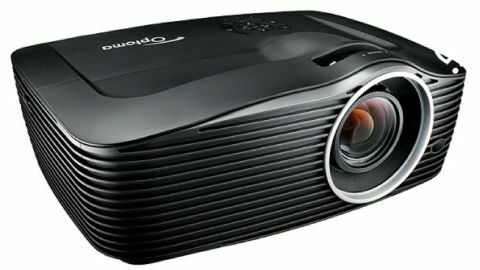 The HD36 is big at 386x280x162mm, and weighs 4.5kg size (it uses the same chassis as the Optoma HD50), so this isn't a projector to bandy about. Its large bulb stands proud just off-centre in the chassis, with a 1.5x optical zoom lens control sitting above. A focus slider up here would have been useful; instead, there's a focus ring is around the lens itself, which is a little tricky to get to. However, there is a vertical lens shift lever nearby, which is the one thing I would advise looking for if you're at all nervous about setting-up a project (the other, a horizontal lens shift lever, makes it even easier). There is a keystone correction option available, too. Although it appears to be a home cinema-centric projector – and boasts DLP chip-maker Texas Instruments' Brilliant Colour system – the HD36 reveals its true colours around the back. The sole HDMI provided just isn't enough. Sure, there's a DVI input here, too, but that's not going to help anyone wanting to attach a Blu-ray player and a games console. Since most laptops now use HDMI, I don't see the point of DVI. Others ins and outs include two VGA inputs for a PC or laptop, S-video, composite video, a VGA out, an RS-232C control panel, plenty of left/right audio inputs, and a USB slot for powering-up 3D specs (none of which are included in the box – you'll need to invest £200 in the separate ZF2300 3D 'starter kit'). That's a pretty serious amount of connections and options, but it doesn't really scream 'home cinema'. Set-up is a cinch using the HD36's adjustable feet on the undercarriage and that zoom and lens shift lever, while a backlit remote control is handy if the HD36 is used in a blackout. Happily, images are endlessly customisable, which will catch the attention of home cinema aficionados alienated by the HD36's single HDMI input and business-biased ins and outs. Being bright enough for use in daylight while also being able to project accurate-looking colours is the real trick for modern home cinema projectors. Happily, the HD36 does just that. My Blu-ray test disc, the wonderfully nuanced and varied animation of The Tale Of The Princess Kaguya, was projected with exceptional brightness when watched at noon, though areas of black can look washed out. Left on the Bright setting, day-time viewing gets well-saturated colours and high Full HD detail. Put the lamp onto Cinema mode if you're watching with the lights out and you'll get decent black levels if Dynamic Black is activated in the Advanced section of the onscreen menus. That's unusual for a low priced high-brightness DLP beamer. Impressively, motion handling is excellent whatever the brightness, with a smooth rendition of fast moving scenes and sport. However, put a football match through the HD36 (I watched the Charity Shield game between Arsenal and Chelsea) and it's immediately apparent that this project does not reproduce green quite so vividly as other projectors. It's a good job too; arguably this failing is an absolute boon if you're a sports fan sick of watching luminous green pitches on projectors in pubs and clubs. What's more, the HD36 treats all sources of video well. The HD36's images also look impressively clean, with a built-in noise reduction system on hand to clean-up my test DVD Master & Commander.